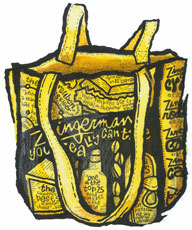 Zingerman's Yellow Canvas Tote Bag for sale. Buy online at Zingerman's Mail Order. Gourmet Gifts. Food Gifts. Our classic shopping bag, made permanent. Patterned after Zingerman's signature yellow-and-black plastic shopping bag, this cotton tote is similarly porportioned to be tall, not broad. Made of heavy canvas with durable double-stitch handles that are long enough to fit over your shoulder, it can handle very heavy loads.